Use the Records Management Metadata Model as an exhibit attachment to the Records Survey and Inventory Analysis. 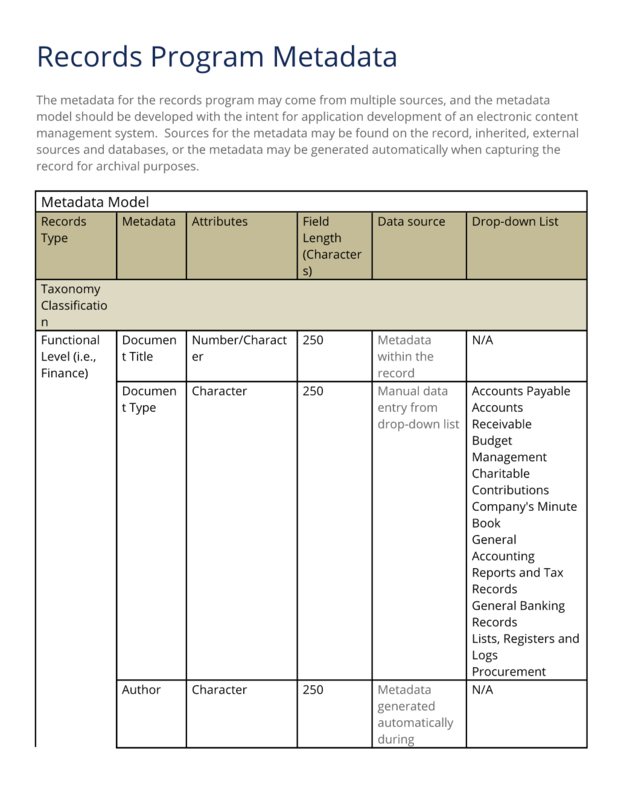 The metadata model defines attributes of fields used to electronically store records management data. This Records Management Metadata Model is included in an editable format that can be customized for your own needs. How do you write a Records Management Metadata Model document? The metadata for the records program may come from multiple sources, and the metadata model should be developed with the intent for application development of an electronic content management system. Sources for the metadata may be found on the record, inherited, external sources and databases, or the metadata may be generated automatically when capturing the record for archival purposes. Metadata Model Records Type Metadata Attributes Field Length. Data source Drop-down List Taxonomy Classification Functional Level (i.e., Finance) Document Title Number/Character 250 Metadata within the record N/A Document Type Character 250 Manual data entry from drop-down list Accounts Payable. General Accounting Reports and Tax Records. Procurement Author Character 250 Metadata generated automatically during capture of the record N/A Unique ID Number 15 System generated, map defined metadata attributes, specific business and/or technical requirements N/A Create Date Date 10 System generated N/A Cutoff Date Date 10 Metadata inherited from the records classification scheme for disposition N/A Security Group Character 60 Metadata provided by user details according to the user's log on Public. The editable Records Management Metadata Model document - complete with the actual formatting and layout is available in the retail Proposal Kit Professional.